Hoods are usually made of steel. The bigger the vehicle is, the heavier the hood is. Opening and closing the hood can be extremely troublesome, especially in a case of emergency for people who does not do work on his/her vehicle on regular basis. Many people want to open / close the hood much more lightly and easily. To meet such demands, TEIN has developed HOOD DAMPER. HOOD DAMPER is designed to be lightweight and compact, so that it does not get in the way of any works around the engine bay. As the main body of the damper only weights 200g and the extension that adjust the full-open angle of the hood is made of Aluminum, the product is amazingly lightweight even with all parts/components attached. HOOD DAMPER has met our strict quality standard and passed one hundred thousand times of Expansion & Contraction Test. In consideration of severe use conditions, as it is placed inside the engine bay, surfaces of each and every part are specially treated for corrosion-proof to stand 5 years of use. 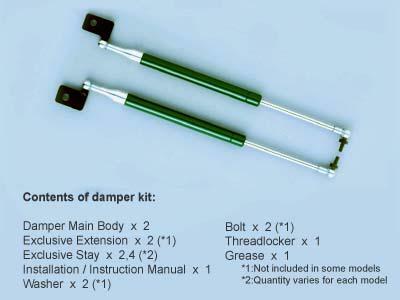 HOOD DAMPER is designed to be installed without any modification to the vehicle, so that many users can install by themselves. All needed is some simple tools!